Tomato Soup is today’s challenge for out Tried and Tasted Team. Often tomato soups can be creamy, bumping up the calories, but our Taste Team tackled a few low calorie tomatoe soups – take a look and see how these compare. It’s a classic favourite but the delicious, creamy taste of tomato soup is often the result of a few extra calories. There are low calorie versions available, but how do they match up? We’ve taken six delicious tomato soups, all under 180 calories and given them to our shrewd Taste Team to put them through their paces. The Tried and Tasted Team have sampled them all and the verdict is in – take a look at how they did. The colour was that of classic Heinz Tomato Soup. Some tasters were put off by a ‘scum ring’ although that could have been poor cooking skills by the Tried and Tasted Chef! A creamy tomato soup (but with an orange glow which put us off slightly!) One taster described Baxters offering as ‘lumpy vegetable water,’ however most seemed to like it, although agreed it seemed more of a vegetable than a tomato soup. Lovely tomato smell. ‘Like tomato soup’ – the smell was what is should be. A vegetable smell over-powered that of tomatoes. All the tasters loved this soup – in fact there was very little left in the bowl, as one taster went back for seconds, and thirds, and fourths! The tasters enjoyed this soup, and although some thought it could have packed a better punch, most enjoyed the flavour which was described as ‘tangy’ and ‘gorgeous.’ One taster was distinctly unimpressed by the amount of vegetables in a tomato soup (we won’t mention his exact words!) The other tasters who had a more relaxed vegetable policy enjoyed the soup, but still couldn’t help noticing that it should have more tomato. A messy taster spilt her soup down her front, but those that didn’t miss their mouths thought it would be very filling - excellent for a winter’s day. The soup was thought to be fairly filling – it might need bread to make a good meal. The tasters thought it would be filling but mainly because of the veg content. One of our team really went to town on his description of the texture. He thought the soup was ‘creamy, sumptuous and velvety’ – an excellent winner in the tomato soup category. Thick Chunky – but again because of the veg. The winner of the day, Weight Watchers pulled it out of the bag with their tomato soup. Most tasters thought this might have something to do with the fact it was made by Heinz, creators of the original tomato soup we all love! A close second, Tesco was a hit with their Light Choices Tomato Soup. It was the cheapest, but surprisingly for a light version it had the highest calorie content – a good lesson learned that you should always read the label and not rely on the brand! Baxters came in joint third with their soup. They may have rated higher, but most tasters felt that it had far too much veg to be called a tomato soup. Baxters was the most expensive and second highest in calories, so look elsewhere for a proper tomato soup. ‘Lumpy, greasy, foul’ – the tasters were surprised they managed to eat any after that description! The soup looked good but it's appearance lulled our tasters into a false sense of security as they found out on the taste test. Next time they will be more wary! The main complaint from the Taste Team was that the soup was too dark and almost brown in colour which was a bit off-putting. ‘Strange,’ ‘weird’ and ‘not of this world’ – we couldn’t quite put our finger on it! The herbs over-powered the tomato smell. There were mixed comments about the smell but none were complimentary. Some of the team enjoyed the sweetness of the soup and one taster with a particularly sensitive palate commented on the ‘complex’ flavours! However this soup was let down by being too watery, cancelling out some of the taste. Although one taster thoroughly enjoyed the ‘basilly’ taste, most weren’t impressed. If you are a basil fan it might be up your street, but the Taste Team rated it low. The general consensus was that Asda had gone overboard on the basil resulting in an acrid aftertaste. The Taste Team didn’t think that a burning sensation in the throat should necessarily accompany what should be a delicious winter warmer. Unfortunately not filling enough for a proper meal unless accompanied by bread. Most people agreed they would be fairly full after a tin. The tasters agreed that they didn’t want to eat enough to find out if it would fill them up. One of the team even suggested he’d rather feed it to his dog! Adding basil to their tomato soup clearly didn’t earn Weight Watchers any points! Our second Weight Watchers product came in an average third. Surprisingly Waitrose came in fifth with a large overdose of basil. This Tomato Soup was mid-range on the calories but fairly pricey, our taste team thinks you can find better. Asda failed to impress and in a tough group came in last. The soup was neither the lowest in calories nor the best in flavour and as it left our tasters with sad faces it definitely didn’t score highly! If you do accidently buy some, perhaps take our taster’s advice and see if the dog likes it! 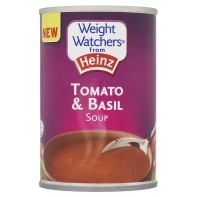 Our tomato ‘Soup of the Day’ is Weight Watchers from Heinz Tomato Soup! This was the outright winner and highly recommended by our Tried and Tasted Team. 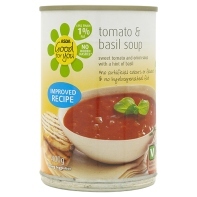 Cheap and low in calories Weight Watchers prove that you can have a delicious and healthy soup all-in-one! Choose the healthiest tomato soup and keep track of those calories using the WLR Food Diary to track your calorie intake. Try it free for 24 hours.